If I could go back to camp. . . 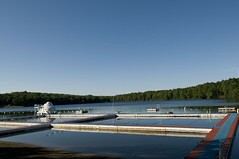 If you’re a summer camp alum, and you had some extra wishes lying around, would you use one to go back to summer camp? If you could go back today, what would you do? We asked and you answered, on Facebook and on Twitter. …sort dirty laundry in HQ!!! …coach our 7th grade girl’s softball team to victory…again!!! …Find out who really lived in that House that we all thought was Haunted back in the sixties. Anyone remember that house? What would you do if you could go back to camp today? Use the comments section to let us know! I don’t know about you, but a good number of my current communities are one step away from reality — they only exist online. I have a Facebook community, which includes a good number of friends-of-friends that I’ve never met in person. I visit a set list of blogs every day and have a great time interacting with the authors and the other readers. While our definition of community might be expanding, I don’t think any of us have lost sight of the importance of a good, old-fashioned in-person community though. 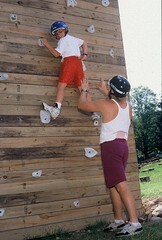 According to the American Camp Association, parents have identified the development of social skills/living in community (such as making new friends, getting along with others, becoming more responsible, and learning group-living skills) as one of the main reasons they send their children to camp. The owners, directors and staff at summer camp all understand the power of community and structure these skills into their programs in several areas. I am an only child, and as such, I always had my own room when I was a child, so living in a camp bunk for the first time was a huge learning experience. For the first time, I had to be part of a community of people who were sharing space, delegating work and working, communally, to make things work. It didn’t take long for me to get into the routine of doing my part and see how even the most menial job — mine was taking out the trash – contributed to the health of the community. Bunkmates must also learn how to navigate the waters of communal decisionmaking. They must work through the inevitable issues and conflicts that come up in bunk living — and they must learn to adapt and get along when things don’t go their way. They learn to live by the will of the majority, while at the same time respecting the needs of others who represent the minority. Again, according to the ACA, “small group living also provides the necessary intimacy for individuals to achieve a sense of belonging, explore a variety of group roles, cooperate and form relationships with others, and have input into the group’s activities”. In the past few years there has been a large ad campaign promoting family dinners. Sitting around the dinner table sharing stories, concerns and the high and low points of your day with family members — or fellow campers — creates intimate bonds between all of the participants. Most camps have family-style meals and singing traditional camp songs together is often a ritual. Songs are always a founding piece of any culture and at camp, at the end of session when everyone knows the camp songs, they too become community bonds that live through the years. Although sometimes I am annoyed with how much of my life occurs online, there’s no arguing that modern social networking has helped nurture the lifelong friendships developed at camp. Now, instead of waiting days or week from a letter from a camp pen pal, you can send a text message, IM, or just nudge them on Facebook. Many camps have Facebook groups, some devoted exclusively to alumni from certain years, so the 50-somethings reminiscing about camp in the 70s can be a subgroup of a larger online camp community. Camp Weequahic bike races. I’m guessing early 1980s here. Any alumni want to chime in? No matter how much time passes, the camp community lives on. Alumni have frequent get-togethers and are always welcome to spend a day visiting their old camp haunts. Many camps host reunions every year and invite alumni from different generations to come and visit together, creating yet another community, another branch of the family tree. 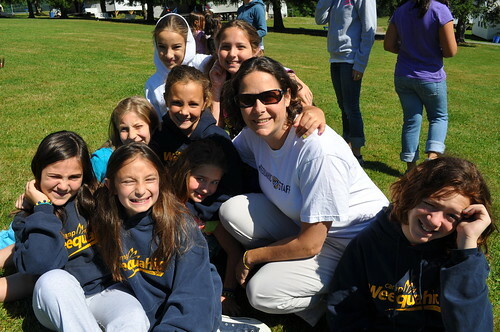 Want to get connected with Camp Weequahic again? Check out the Facebook page! How did you experience community at camp? How have you sustained it since? We’d love to hear your stories in the comments below! Summer Camp is a time of firsts. The first time you try to catch a ball with a lacrosse stick (and realize you can!). The first time you get on on water-skis. The first time you serve an ace in tennis. The first time you get up on stage in front of hundreds of kids your age. Now that camp has ended for the summer and everyone is getting ready for the school year, we thought we’d share some tales from camp. What have the kids taken home with them to last the next 9 months, until camp starts again? My own summer camp experiences – way back in the 80s – were largely defined by a feeling of the summer camp community breaking apart at the end of the summer. We would often promise to write letters we never sent or make long distance calls our parents wouldn’t pay for, but when summer was over, camp was tucked firmly behind us for another year. With today’s technology, however, the summer camp community can stay together all year, even when they return to the home cities, states and countries. Each of the AFSC family of camps has an active Facebook community where current campers, families and alumni can connect, share stories and keep up to date with the staff and the current session. In these waning days of August, much of the chatter is about how much everyone misses camp and wishes they were back on the lake, singing in the dining hall, etc. For those who’ve connected to Weequahic through facebook and other new social networks (Twitter anyone?) the camp experience doesn’t end with teary good-byes in August. So when will we meet again? The shorter season camps have come to an end, and we asked parents and kids to share with us some of the lessons they learned from their first foray into summer camp. Martha was born and raised in Peru, and had no childhood experience summer camps. Last year, a family friend sent her child to camp for the first time, so Martha decided to try it this year with her 9 year old son, Jaden. Other kids were talking about summer camp and Jaden was full of questions. “I didn’t push him to go,” she says, “He was ready to go. Jaden is a child who enjoys everything. He’s a very adaptable kid.” Jaden is a self-described Lego-builder, reader (The Warrior series, currently), and he loves to play Wii. When asked to finish the sentence “Camp is like ___” he had just one word in mind: FUN! When asked about the funniest thing at camp? “When we were playing waffle ball with shaving cream and we all got covered with it. I looked funny!” he says. This year Martha chose the 3-week option for Jaden. “I think he could have done the six weeks,” she says, “but for me it was too long. Next year he will go for six weeks.” Martha says camp will make Jaden a better person because he is making friends, having fun, learning new skills, and dealing with emotions like homesickness. Martha said the camp’s efforts to keep in touch with her were incredibly helpful in dealing with her own apprehensiveness. The camp sent her frequent updates and she would go online everyday to see the latest photos of camp activities. Wendy and Justin live in Florida, so traveling to Pennsylvania for his first year of camp was a big deal for the entire family. Justin had never been away from home for more than two days. “It was scary for me,” Wendy says, “wondering how it was going to be for him.” Not for long though. “The camp makes it easy on the parents,” she says now. “They post hundreds of pictures every day.” The first picture she saw of Justin was of him getting off the bus with a huge smile on his face. The next day he was at the lake on the water trampoline. “Those photos are the best way to do start conversations,” she says. “Make sure you go to visiting day,” Wendy also advises, “so you can live what they did and so you know the people they know.” This way, when Justin talks about camp experiences, Wendy can really share with him. She has been on the tennis courts, seen the music room, walked to the archery targets and swung the same golf clubs Justin learned on. “When we sat down to tag all the photos we thought were cool, his were totally different than mine. Things I thought were just nice,” she says, “he thought were the coolest things. Justin would describe people in the pictures as well as all of the activities that he participated in. “He grew up,” she says. 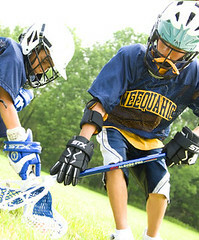 Both Justin and Jaden attended Camp Weequahic this summer. They have both already made plans with their bunk mates to be back next year. For 6 weeks! What is camp without Color War? Divided into teams of equal athletic, creative, and enthusiastic skills, campers compete in these multi-day events to end each session. “Tribals” involves four teams who vie to become the “Keeper of the Deed to the Land.” Ending our first session each summer, the campers and staff of Weequahic represented four different nations: Cherokee, Iroquois, Seneca, and Dakota. The nations change each year with the exception of the previous winner. Competitions ranged across the sport fields to the art rooms and even into the kitchen where each camper strives to bring valuable points to their teams. We develop the teams and events so that everyone adds value, regardless of their interests and abilities. This year, Cherokee outlasted a surging Dakota team at the last few moments of our Gitchee Goomee, a relay race around camp. Cherokee now holds the Deed until the next summer. Not to be outdone, Olympics holds enormous sway of the last few days of our second session. Since 1953, Army and Navy have competed over four days to determine the victors. Whether competing in novelties (like Marble Call), lining up in formation, challenging one another on the soccer field, or bursting with excitement at the Sing, Olympics is a good natured (and slightly intense) end to each summer. Both competitions keep the journey rather than the outcome as its ultimate goal and sportsmanship as the highest value. Our program heads and key staff members serve as Judges during both competitions to ensure the proper outcomes, keep the competitions fair, and continual reminder our campers and staff that, regardless of the team they are on, everyone is a valued part of Weequahic. Introducing our Girls’ Head Counselor, Amanda Robertson, otherwise known as Tiny Ham. Though her name may sound small she has an enormous presence in our camp. A vivacious and inspirational leader she comes to Weequahic with tremendous camping experience. Having worked for seven years at a reputable Northeast residential camp, she brings with her a love of camp-life and campers. Her enthusiastic and creative contributions to daily programming, special events and evening activities are fantastic. She is thrilled to be at Weequahic for the endearing campers, beautiful setting and strong relationship with her colleagues and friends. What distinguishes Tiny among our fantastic leadership is her ability to connect with girls of all ages, including our female counselors. She works tirelessly to ensure that the overall bunk experience is a positive one for all the girls. She has her nimble hands in all facets of camp life and whether she is MC’ing the Miss Weequahic Evening Activity or teaching an early morning water aerobics class she wears a bright and engaging smile. Her ability to understand the nuances of young girls is impressive and she is am amazing role model. She is as playful as she is responsible and balances her duties admirably. Born and raised in Tennessee, Tiny moved to Atlanta, GA to pursue her career as a school psychologist; she simply loves working with kids. 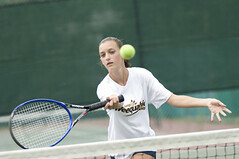 When not mentoring youngsters, she enjoys the outdoors, watching sports, reading and traveling. Weequahic is indebted to Tiny for her seamless transition to our camp and her deep commitment to fulfilling our mission and traditions. Thanks, Tiny! Yum, it is mealtime! And our hats are off to Wayne, the tireless Chef who feeds our entire camp as if we were his family. After 15 summers at Weequahic, it is no surprise as this has become his summer home. Supported by a cheerful staff each meal is fresh, ready and waiting as our ravenous campers enter the building. Wayne’s primary objective is to keep the campers healthy and happy. 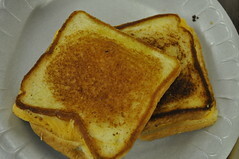 To that end, he collaborates with Cole to provide a camper-centric and healthy menu. Full of loud cheer, the chanting is voluminous and spirited. Table games keep groups amused, while others enjoy the opportunity to sit and chat over a tasty meal. The energy is infectious and laughter contagious. It is where we celebrate birthdays, share announcements, honor sports teams or simply sing. After a long summer day, the air conditioned dining hall is an added bonus for all. 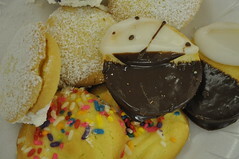 Whether dining on eggs, ham and English muffins, pizza or matzo ball soup and baked chicken, smiles abound. The food is delicious and among the campers favorites are: Maryland style Fried Chicken, Sloppy Joes, Grilled Cheese and Tomato Soup, and Chicken Nuggets. A nutritious salad bar is always available stocked by the friendly Jared and it is refreshing to see how many campers enjoy this option. His homemade dressings and daily surprises keep the campers coming back each lunch and dinner. The occasional BBQ meal is a nice break from the dining hall where campers gather to eat in the picnic area. It is such a pleasure to dine amidst such a beautiful setting. Alan the Baker, otherwise known as ATB, is busy baking homemade treats for all. After 21 years in our kitchen, he claims the kids love the brownies or chocolate chip cake most of all. Campers may argue that the Black and Whites may be a close second. Thanks to ATB the kids enjoy homemade breads with every meal including, French, Italian and Chala breads. 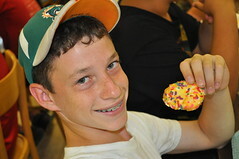 It is the variety of all baked goods that he strives for, he is always thinking about the campers. The fresh fruit and fruit bowls are always a nice touch. 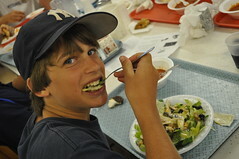 Weequahic’s hearty meals keep all the campers and staff going day in and day out. A big thanks to the kitchen for their hard work and care! 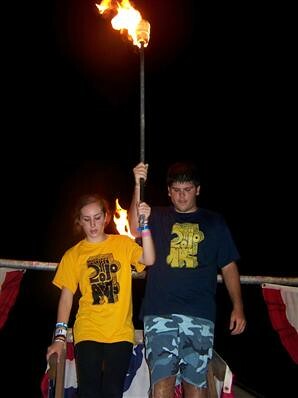 Project Runway and Survivor come to Camp Weequahic! 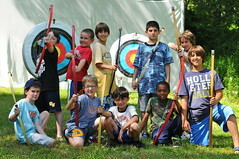 Each week campers gather for Special Event days centered on certain themes. 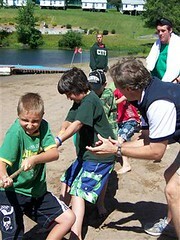 Providing a break in the day-to-day activities, these events are designed to foster camp spirit and unity. On these days campers bond in a positive way using important skills such as teamwork, creativity, organization, and leadership. Laughter and cheer can be heard across camp, capturing the fun involved as well. The first happening for the boys featured Weequahic Survivor, led by our proud CIT leaders. Demonstrating their competitive edge, the boys of all ages swam, climbed, trekked and solved riddles, striving throughout the day. They had a ball. Meanwhile, on the other side of camp the girls were putting their imagination and originality to work in preparation for Weequahic’s Project Runway. Each bunk received a box that included an amalgamation of fabrics and decorations in which to create an evening gown and a “green” themed dress. One counselor from each bunk modeled the finished products that were judged by our fashionable leaders, Kate, Sue, Judy and Brie. The dresses were quite impressive and the girls enjoyed the collaboration in constructing them. Alex S. loved the teamwork aspect of the day and Alex B. thought the obstacle course in the gym was the most exciting part. Max enjoyed every aspect of the day and the culminating relay race was his favorite of all. He especially appreciated the change in scheduling. Lucas raved about the competition and likened the event to a mini color war. Lauren enjoyed the freedom and independence of creating designs, while Carly had fun selecting the music to accompany their final presentation. Demi and Claire had fun dressing their counselors and seeing the other bunk’s creations. Maren liked how it brought out everyone’s creative side. Upcoming events to look forward to include a carnival and of course, the three day Tribal War. 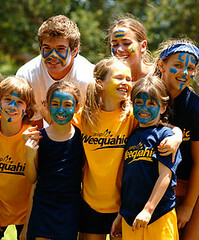 Campers eagerly anticipate creating lasting memories together while carrying on the traditions of Camp Weequahic. Kiersten Johnson, the head of our girl’s lower camp is a woman on the go! A mother of three herself, it is no surprise that she is able to shepherd our 29 youngsters so swiftly. 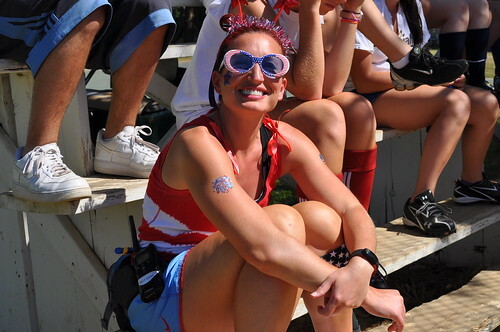 She works deftly to assure that the campers and counselors are happy, healthy and safe. And, are they ever! Kiersten treats the kids as her own and can be found arm and arm with one girl or surrounded by a gaggle of five to ten. There is no doubt that her sunny disposition and warm heart help win the affection of those around her. While this is her first summer at Weequahic, she has spent many of her adult years working in camping, in addition to a lifetime spent at family camp. 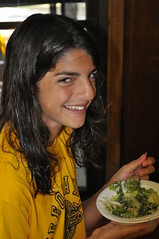 Her favorite part about working at camp is witnessing the personal growth of both campers and counselors. Kiersten is a consummate professional; her instincts are spot on and she works hard to do things right, the Weequahic way. A self-proclaimed gypsy, Kiersten is an explorer. Since college she has literally moved every three years seeking adventure for her and her family, living in Ohio, South Carolina and Florida, to name a few states. When she returns from camp she intends to put her house on the market and set off for another home. Her three children are home schooled which makes this journey together easier. Their lives are surrounded by service and music as the Johnsons often perform musically at church or in senior homes, for example. A handy woman indeed, Kiersten is happiest when tearing down walls, installing bathrooms and remodeling homes. When not at camp, Kiersten is deeply committed to working as a consultant for autistic children. She has earned a certificate in Applied Behavioral Analysis and as a leading expert in the field she speaks nationally at conferences. She has been responsible for training teachers as well as entire school districts. She also devotes her time contributing to the enhancement of non-profit organizations. Her proudest accomplishment to date is her recent production of a documentary film that she hopes will have widespread impact on the lives of autistic children. Thank you, Kiersten! Camp Weequahic is grateful for the work you do each day. I don’t know about you, but my kids are constantly plugged into something, whether they are texting their friends (does anyone talk anymore? ), bopping along to Lady Gaga’s latest, updating their Facebook status, researching a school project online and creating a multi-media presentation, or playing games on my iPhone while I desperately try to finish a conversation at the vet’s office. Some days I can win a battle or two (no texting at dinner!) but the war is ongoing. And honestly, I’m not the best example. That iPhone I mentioned is never far from reach, and right now I’m surfing online, listening to my own brand of pop music, answering text messages as they come in and writing this blog. Don’t you wish there was a place where we could all live life unplugged? We adults may not be so lucky; but for our kids, that place is summer camp. Knowing that someone out there is cultivating a culture of back-to-basics, low-tech life is an irresistible draw for me as a parent. My husband and I love the outdoors and frequently take our kids on short camping trips, but these offer only a short break from the world of “screen time”. Monday morning comes and before the sleeping bags air out, we’re all rushing to see what awaits us in our email inboxes. As a mom, I worry about the long-term effects of all of these tech ways of communicating. I’m not alone. Several studies have suggested that kids who spend too much time plugged in lose some skills for interpersonal interaction. Let’s fight back. At camp, social interaction is done the old fashioned way – face-to-face. Campers and counselors alike leave their cell phones at home and get back to a simpler life, when there is an art to conversation. If you were a camper, think back to your best memories. All of mine involve revolve around interpersonal interactions you just can’t get through an email: telling stories around a camp fire; sharing hushed secrets late into the night; telling the worst jokes you ever heard; huddling together to decide the best capture-the-flag strategy. Friendship doesn’t need a high-tech interface. Don’t think your kids will get with the program? Check out this Seventeen article where teen girls share their favorite summer camp memories. Not one involves a cell phone, I promise! Thanks to Pink_Sherbert_Photography and eron_gpsfs for the photos!